Every once in a while, someone will call in and ask, “What is the very best out the front knife on the market?” Not knowing the person, or their specific needs and wants in a knife, we invariably bring up the Microtech Ultratech series. If you have never had an out the front knife before, the Ultratech stands at the top of the pile for several reasons. First, the size. Regardless of what you are planning on doing with your knife, at some point you want to hold it in your hand and use it. Some people buy knives for a collection. Others buy knives to use at work. Still others, carry a knife at all times for everyday reasons. But in the end, a knife is made to be held in your hand. The Ultratech out the front knives are just about 1/2″ thick (not including the pocket clip) and go from just under 7/8″ wide at the base (by the glass breaker) to just over 7/8″ wide at the top (where the blade comes out). The handle flares just slightly at the top. All of these measurements are to show that the Ultratech knife is just the perfect size for a slim knife. It feels good in your hand. Like it belongs there. The handle also has just a slight offset about in the middle. This gives your hand just a little extra gripping power. And just below the trigger button, there is handle jimping that gives your thumb more grip as you hold the knife. Second, the quality of the craftmanship. There are thousands of knives on the market today. There are less than ten companies that make production knives that I would grade as extremely high quality. Microtech is one of these companies. Each knife they make is produced with top grade materials and with excellent fit and finish. (Fit and Finish are the terms I use to describe how well all the parts fit together at seams and joints, as well as the overall finish of the knife.) Microtech is one of the best in the category of craftmanship. The Ultratech is built with 6061-T6 aluminum handles that have a mil-spec hard coat anodized finish. The handle on the Ultratech is incredibly smooth to the touch and is extremely durable. 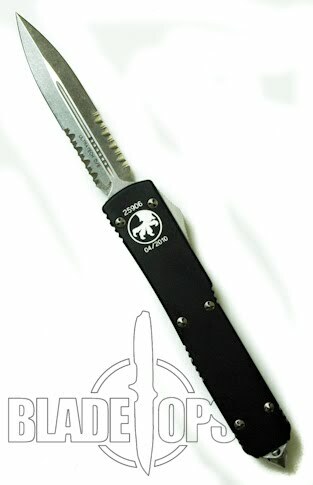 Occasionally, Microtech will produce a special run of Ultratech knives with a different color handle. These quickly become collector’s items and are hard to get. The blade on the Ultratech is made of ATS 34 stainless steel and comes in four basic finishes. You can get it with a DLC black coat finish, a satin finish, a bead blast finish, or a stonewash finish. Additionally, you can get any one of these four blade finishes in a variety of three styles: dual plain edges, dual part serrated edges, or dual edges with one plain edge and one full serrated edge. The variety of styles . Finally, the action. The Ultratech has some of the best action you will see in an out the front knife. The blade comes out incredibly fast. It locks in open extremely tight with nearly no blade movement. Besides materials and craftmanship, this is the biggest difference between a high quality OTF knife and a low end OTF knife. The low end knives invariably have blade play in them. The high end OTF knives should not. The Ultratch has as close to none as I have seen. The blade opens and closes with the same slide trigger. And it is hard to not sit and open, close, open, close over and over. Because the Ultratech is so well made, it is an easy choice for veteran knife collectors and first timers alike. So when people call up and say they are looking for a really good out the front knife, I always make sure they consider the Ultratech.